It looks like the lying is finally over after a decade of denying doping. After lawsuits and vicious attacks against his detractors, Lance Armstrong finally admits to Oprah in an interview to air on “Oprah’s Next Chapter” on Jan. 17, that he doped his way to 7 Tour de France victories in what some are calling an emotional interview where Armstrong admits that he took performance enhancing drugs. The Lance Armstrong doping fraud is being called the greatest deception in sports history. Officials are now recommending a whistle blower federal lawsuit against the once admired athlete who has fallen from grace, in order to recoup millions of dollars that were paid to him with US Postal Service money from sponsoring his team. For those who have followed the twists and turns of Armstrong’s story over the years, there doesn’t seem to be much sympathy for a man who has lied and made threats against decent people who came forward with the truth. Armstrong not only denied ever using performance enhancing drugs under oath, he did so in an indignant, even threatening way to honest people who came forward with the truth. Now that his back is against the wall, Armstrong is also talking to authorities about confessing and naming names, giving up others involved in illegal doping to try and mitigate his own damages. According to the media, if Armstrong provides substantial and meaningful information, it may result in a reduction of his lifetime ban. 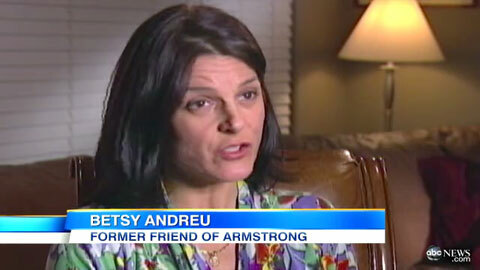 Betsy Andreu and her husband were close friends of Armstrong’s for years before being attacked by Armstrong for refusing to lie. Armstrong’s confession to Oprah, came just a couple of hours after a heart wrenching apology to staff at the Livestrong charity he founded and has now been forced to surrender. Armstrong, who recovered from testicular cancer, resigned late last year as chairman of the LIVESTRONG Foundation, which raised millions of dollars in the fight against cancer. Winfrey would not characterize whether Armstrong seemed contrite but said he seemed ready for the interview. “I would say that he met the moment,” she said.